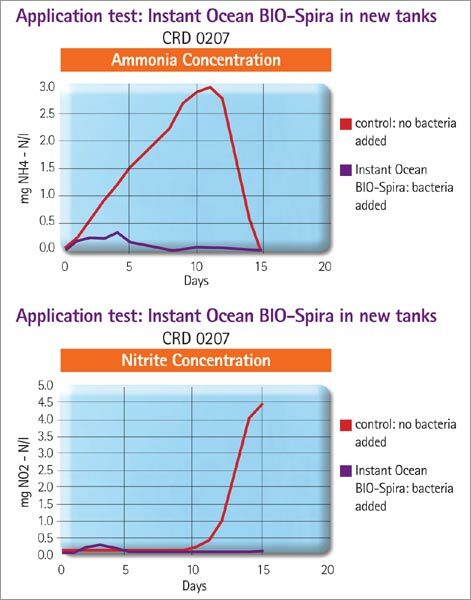 BIO-Spira by Instant Ocean is designed to prevent “new-tank syndrome.” As we all (hopefully) know, when a new tank is set up, it is vital that we let the tank cycle, before introducing any livestock. The cycle, refers to the nitrogen cycle, where bacteria converts ammonia into nitrite and then nitrite into nitrate. The process is normally put in motion by the addition of live rock which contains a bacteria, and other life forms. The addition of live rock will lead to some “die off” which will result in ammonia being present in the water column. We will write a more complete discussion of the cycle shortly, but for now, let’s get back to BIO-Spira. BIO-Spira does not need to be refrigerated, as it is not based on live strains of bacteria. It can be stored at room temperature, and is ready for use anytime. To use, simply shake well, and add 100ml for every 30 gallons of water volume.